A complaint-laden organization that solicits donations nationwide is making a play in New Jersey. 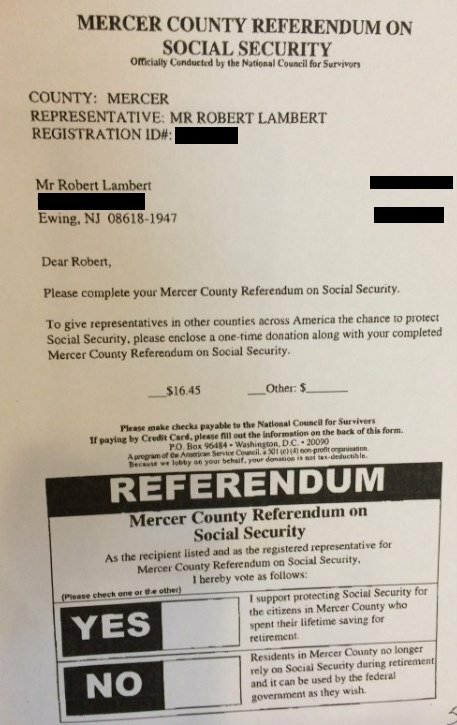 “You have been specifically chosen to represent Mercer County in this Referendum on Social Security campaign,” said a pitch letter received by Bob Lampert of Ewing. “The National Council for Survivors is a grassroots organization that works to protect the hard-earned Social Security benefits owed to America’s seniors,” the letter said. But pretty quickly, Lampert was suspicious. It also asked for money. A one-time donation of $16.45. “I need to send Referendums to every county in America… and your $16.45 will help me send an additional 36 Referendums on Social Security to citizens across America who feel the same way as you and me,” the letter said. You could pay by check or credit card. The return address was a post office box in Washington, D.C. The letter never says what will be done with the “referendums” or who in Washington, D.C. or elsewhere would be presented with the group’s findings. Lampert shared the letter with a friend, who recommended contacting Bamboozled. “I’m so conscious of all these scams that are going around,” Lampert said. He didn’t want others to fall for what he believed was a con. “You can see how some things might attract a person to participate, whether it’s out of wanting to preserve Social Security or being afraid someone is going to take their Social Security check,” Lampert said. We decided to take a closer look. Lampert was right to be guarded. A quick Google search showed both of the groups are the subject of many dozens of online complaints. The complaints name the National Council on Survivors, the American Service Council, Flint, the “founder,” and other related groups. American Service Council has a website, but it doesn’t say much about its initiatives. It offers links to news stories about financial issues that are important to seniors, but little about its own work. In fact, there’s not really any specific information about the group’s work, or its successes. National Council of Survivors is one of the “projects” listed on the site, but there’s no additional detail. Interestingly, American Service Council doesn’t seem sure of its own group’s name. The letter was from the National Council for Survivors, slightly different from the project listing on the website, National Council of Survivors. But where they were delivered, or to whom, isn’t mentioned. Looking around online, we found lots of complaints about the group’s mailings and about Flint. Past campaigns included ones about survivor’s benefits and immigration reform. And in June 2016, a nearly identical campaign to the mailing Lampert received was reported in Minnehaha County, South Dakota. We wondered how the group spends its money. 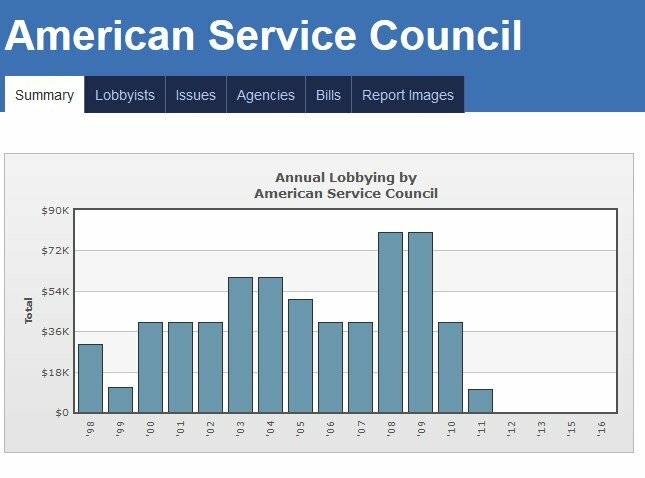 According to OpenSecrets.org, a website that tracks lobbying, the American Service Council has been spending lobbying dollars since 1998. The last year that shows spending is 2011, at $10,000. That’s far lower than the $80,000 it spent in 2008 and 2009, the group’s most active years, according to the site. And though the letter talks about the $16.45 as a “donation,” donations to this group are not tax-deductible as a charitable contribution. 501(c)(4) groups are tax-exempt, but unlike 501(c)(3) charities, donations are not deductible, the IRS says. We reached out to the American Service Council, and its attorney responded via email.Christopher Craig offered information about the group, including its tax status and that its headquarters were in Virginia. “Its mission is to educate and give all Americans a voice and a platform in Washington, DC on the issues close to their hearts, such as Healthcare, US Economic Security, Religious Freedom and Social Security Protection among others,” Craig wrote. He said the group doesn’t work, support or advocate for candidates. We asked for more detail, including what lobbying successes the group has had, where else in New Jersey these letters were sent, and how many. We also asked how much money has been collected and how it would be spent. American Service Council is a registered charity in New Jersey, something that’s required by law for those that raise more than $10,000 a year. The group reported to the Division of Consumer Affairs that 61 percent of its funds go to charity, 12 percent goes to pay management costs and 27 percent is spent on advertising. Any time an organization — charity or not — solicits money, do your research before donating. Check on a charity by calling Consumer Affairs’ Charities Registration Hotline at 973-504-6215, or go online to the Charities Registration page at NJConsumerAffairs.gov. You can also read more about charities at NJConsumerAffairs.com/brief/charity.pdf. Look up the charity on websites such as CharityNavigator.org, GuideStar.org and FoundationCenter.org. Find out how much of the charity’s collections go directly to those in need compared to how much is spent on administrative costs. Also make sure the charity has filed with the IRS as a nonprofit, then check to see what kind of nonprofit it is so you can determine if your donations are tax-deductible. Finally, pay attention to the language used by the charity when it asks for donations. If it tries to induce fear, uses high pressure tactics, warns that you must act quickly? Those are all red flags. And if you’re approached for a donation over the phone or by a knock on your door, tell the rep to send you something in writing you can investigate before donating.